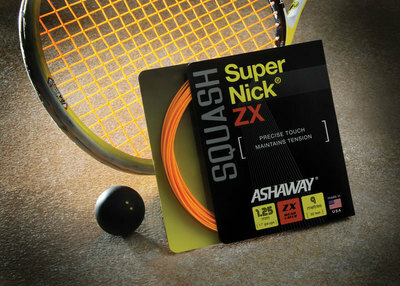 Ashaway, RI - Ashaway Racket Strings has added a new member to their market leading SuperNick® family of squash strings. Dubbed SuperNick ZX, the new 1.25 mm (17 gauge) string utilizes a multifilament nylon core wrapped in a wear layer of high tech Zyex® filaments. The new design provides much better tension stability and durability compared to current SuperNick XL strings, while maintaining the precise response of SuperNick’s traditional multifilament core. A textured surface on the wear layer also increases grip and maximizes ball control and spin potential. SuperNick ZX is designed for three types of players: for those looking for precise touch and excellent feel of the ball; for those who require superior durability and tension maintenance but still want the feel of a SuperNick string; and for players looking for increased ability to control and add spin to the ball. SuperNick ZX is a high visibility orange in color for easy identification on the court. It is available in 9-meter (30 foot) sets, as well as 110-meter (360 foot) reels, and is designed to be strung at tensions up to 40 lbs. (18 kgs. ).